We welcome back one of the clubs favourite performers. 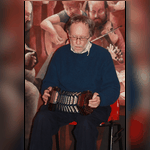 Will is an accomplished Anglo concertina player who has served his time with many groups including the Albion Band . He has some wonderful traditional songs that are rarely heard these days both comic and serious as well as items from the music hall days. Come and sing along.